Last year, our squash took over the garden. 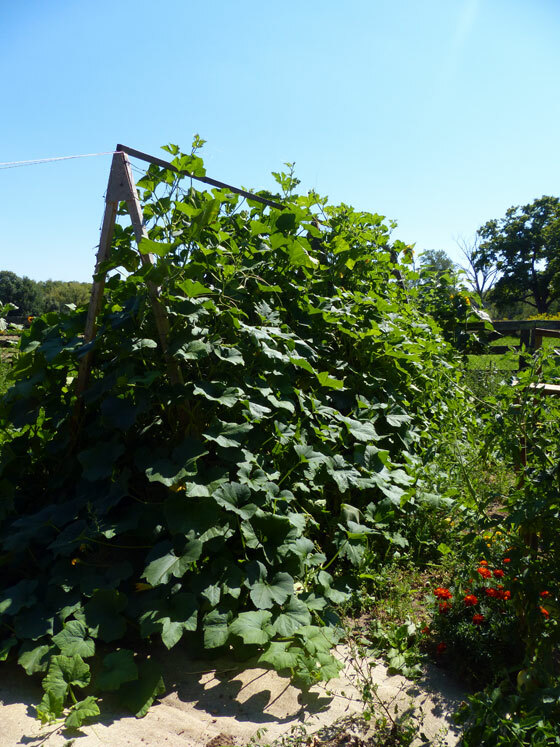 Fully half of our nearly 2,500 square foot garden was completely covered in squash vines. We loved the squash that we harvested, and we knew we were definitely growing squash again. However, we knew that we weren’t willing to give up that much of the garden this year. 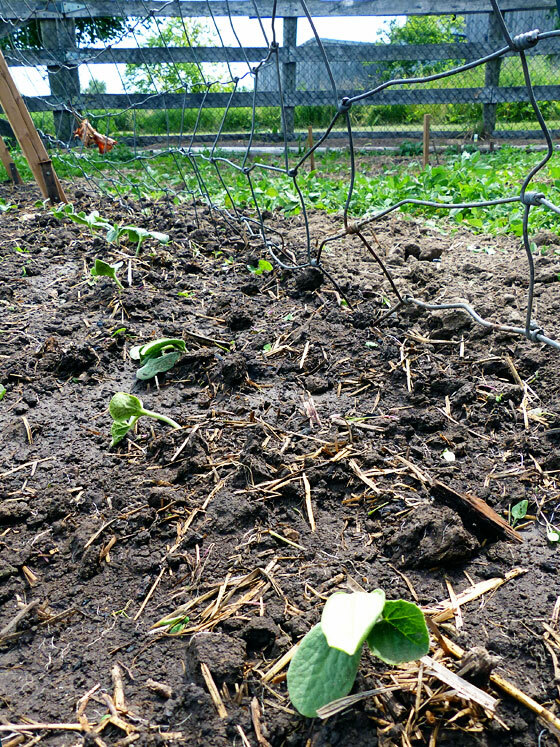 My plan to corral the squash was first to plant less. 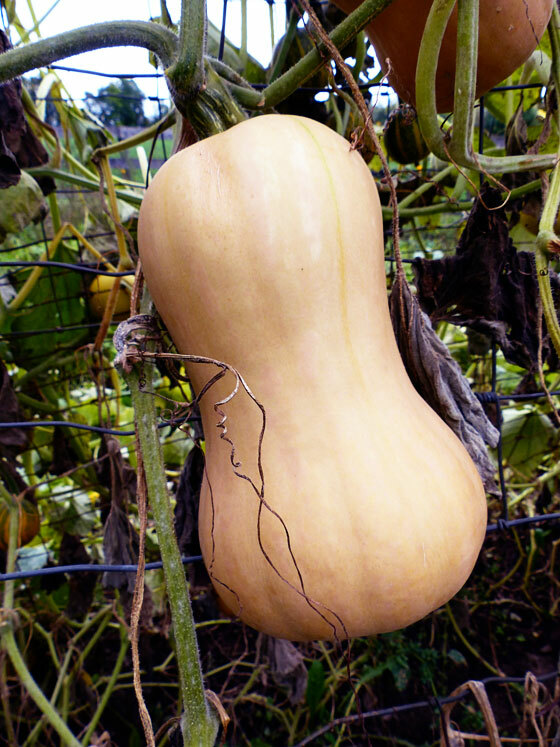 No matter how much we like squash, we cannot eat nearly 40 butternuts and about 70 acorns (last year’s harvest). The second part of the plan was to coax it up, rather than across. Up was a theme of our garden all this season. I’ve already shared how our raspberries and tomatoes are growing vertically. Now it’s time for the report on our final vertical experiment. And this truly was an experiment. We were growing acorn and butternut squash. They weren’t small and lightweight. I wasn’t sure whether the vines would be strong enough to support the hanging fruit. Back in the spring, I built a large A-frame. It was about 8 feet tall and 16 feet long. We used 2x3s for the As with plywood at the peaks for extra stability. The top ridge is two 2x2s. Each A is screwed into stakes that are hammered into the ground. 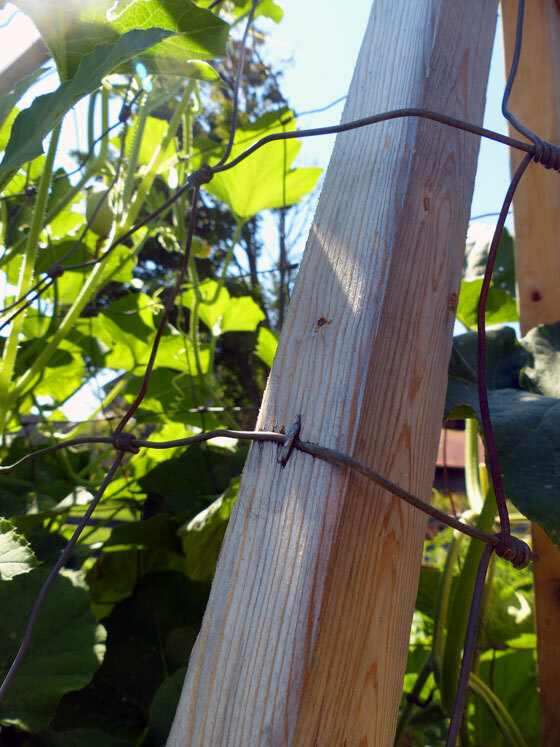 We spread wire fencing across each side and attached it to the wood with big staples. 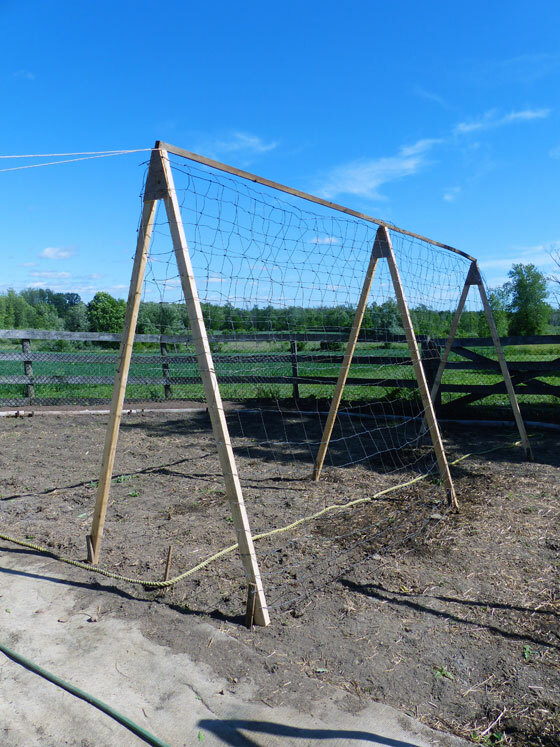 Just for extra stability, we tied each end of the trellis to the fence so that it couldn’t fall over. With the A frame in place, I planted (half) our squash seeds under the trellis. As the plants grew, I tucked the vines into the mesh. The vines were a bit fragile and bruised or even snapped easily. I learned it was important to not let the plants get away from me. I had to be diligent about training them up the trellis before they grew too big. Fortunately, the squash seemed to recover quickly from any of the damage I inflicted. Just like last year, though, the squash took over. Thankfully, this year it took over in the right direction–up. Soon, the whole A frame was completely covered. The plants blossomed and set fruit. And I crossed my fingers that the fruit would stay on the vines long enough to ripen. We’re nearing the end of the season now, and I’m happy to report that things are looking really good. The leaves are starting to die off, so you can see just how good for yourself. Behold, the squash. Yup. Once again, we have a whole lotta squash. And they’re big ‘uns. Oy vey. The butternuts are phenomenal. The acorns are more iffy. But I’m not sure that I can blame the trellis. First, we don’t have quite as many acorns as I was expecting. The butternuts definitely have them beat for quantity. Second, the acorns aren’t exactly all acorns. They come in a few different shapes. Any ideas what would make them grow so differently? Despite some mutants, I’m calling the vertical squash growing experiment a success. It’s definitely a method we’ll be using again. Have you done any experiments in your garden this year? Have you tried vertical gardening? What’s your favourite type of squash? 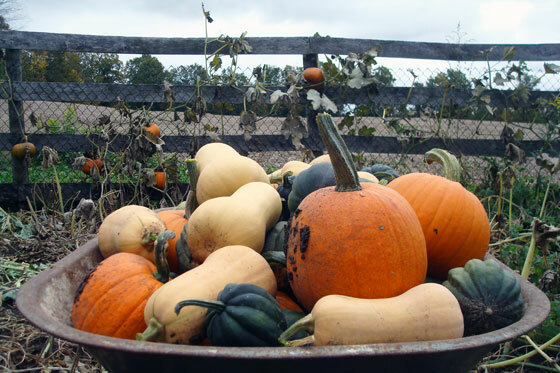 Any tips for storing the squash or recipes to share? Your a-frame worked beautifully Julia! 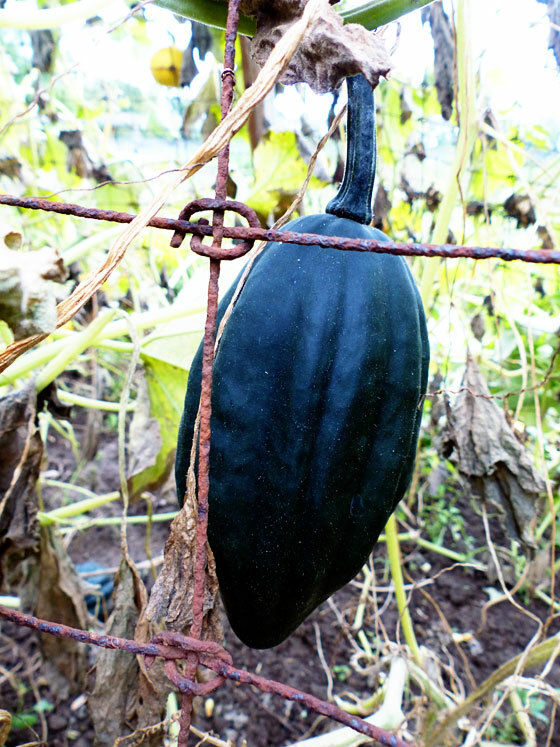 Amazing that the vines were strong enough to support the squash. I wonder if the misshapen acorns has anything to do with not being on the ground…? How do you store your harvest?? Last year, we stored the squash in big cartons in an unheated, unused room in the house. They kept fairly well for the most part, although they did eventually get squishy and fuzzy. I welcome other ideas. We have a cold cellar, so that’s always an option too. Soup is one of my favourite ways to enjoy them too. I had a really good recipe last year… now I need to find it again! Very nice! Could it be cross-pollination? 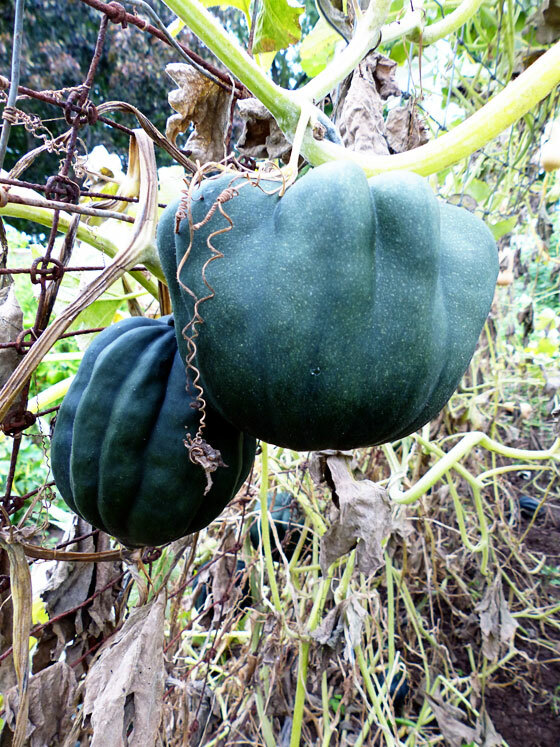 We had “pumkinis” one year when our pumpkins and zucchini crops were accidentally cross-pollinated by nature’s helpers. Wow. Pumkinis. Sounds like a new kind of bathing suit maybe. I never thought of that, although I’ve heard of cross pollination happening with squashes. I definitely will share the taste test. The squash were all intertwined last year, and I don’t recall noticing this mutation, but maybe I just wasn’t as attentive. What a fabulous haul! I’m always astonished by how much your garden produces. The soil must be really good. The vertical growing experiment was definitely a success! 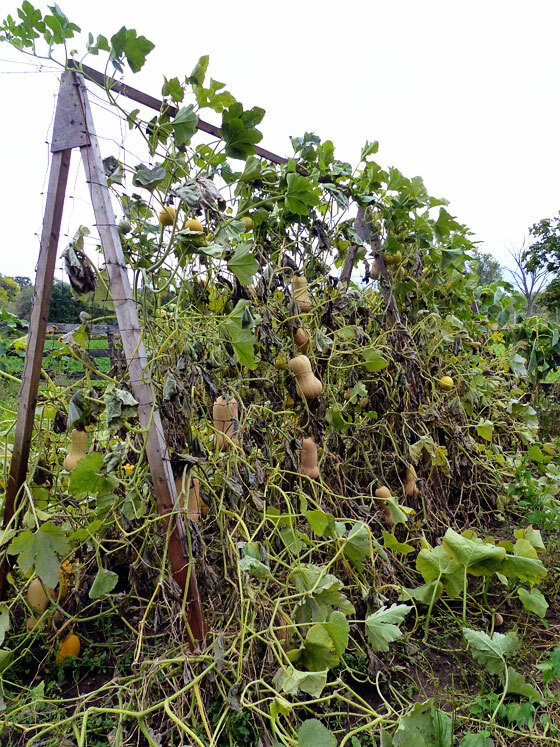 I saw a picture of squashes being grown over an arbour. They grew up over the outside instead of the inside so the arbour itself supported the vines, then the squashes hung down between the grid squares of the arbour ceiling. The people still had their chairs and stuff inside. It was a cool effect! We’re impressed by its productivity too. I’m just hoping we can keep it going. That arbour sounds neat. 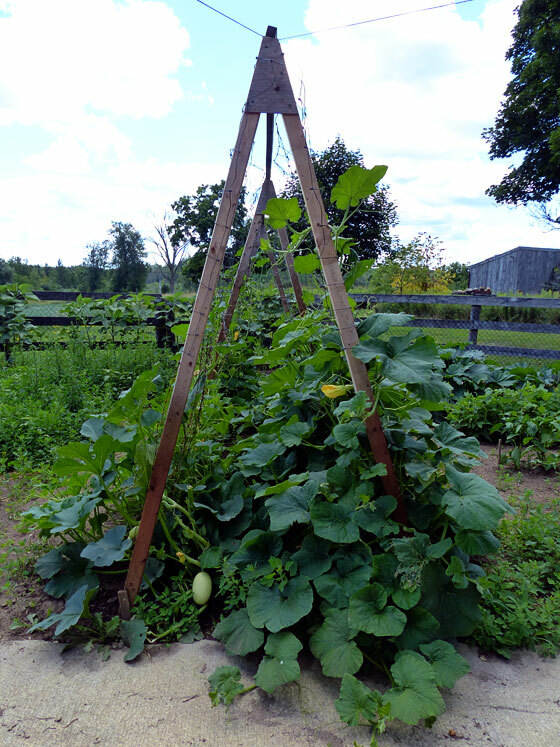 Part of my goal with the A-frame was to give the squash a bit of support in case they proved too heavy forhte vines. When I first started dating Steve, that is how he grew cucumbers, vertically. I had never seen it done that way but it works wonderfully! I love that you can do squash that way. I may try that with my spaghetti squash next year, I can always use a little extra room. I highly recommend it, Sarah.